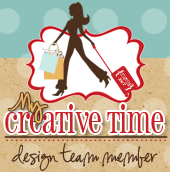 Welcome to DAY 5 of the My Creative Time's 12 days of Christmas Blog Hop. If you came from Liz's blog, you came to the right place. Christmas is just around the corner and most of us still have some shopping do. I know I do! I thought of making a fun and easy journal for my mother-in-law. I bought a composition notebook from Walmart and covered it with designer paper. I then distressed the edges and inked it up with Tim Holtz vintage photo. I then used mod podge to seal the paper. I tied a ribbon around the front cover to give it a soft look. I used Emma's XL Label Die and XL Label Borders for my title. I then stamped "Nana" and the heart using Anyday Bingo Crossword stamps. I added some yellow brads to finish it off. Cute and simple gift!! I really hope she likes it. THIS IS SOOOOOO PRETTY!! I LOVE HOW YOU STAMPED "NANA"!! THAT'S WHAT MY BOYS CALL MY MOTHER IN LAW TOO!!! Very pretty journal. Your mother-in-law will love this. Very pretty and thoughtful gift. Awww ... what a sweet card. So cute!!! What a great idea!!! Adorable. I love this little idea. What a perfect way to make something simple and yet so elegant. Love the big bow. She will love her journal, very nice job!! very pretty! i'm sure she will loooove her journal! Great idea. I like the elegance. Beautiful idea for a journal. I'm sure she will love it. Your card is so pretty, I love the softness! Great gift. I love the idea. Thanks for share. Very pretty journal! She will love it! great binder cover you made!! thanks for sharing! simple but cute! defintely something i can make for all the family hehe Tfs! Very pretty and feminine. I am sure she will love it! Love the journal, It also makes the gift very personal a name on the front. Love your journal...very pretty! I think she will love it they make great gifts. Very pretty journal! What a great gift idea without spending too much money! You dressed up the ordinary and drab to fantastic and fab! She should love writing in it (if she can bring herself to use it [I know I have a hard time using pretty things -- I just want to let them set and look at them]). Beautifuly done! I love the colors you chose and I sure "Nana" will find lots of uses for this beautiful journal! Beautiful journal for Nana!!! I am a Nana and would love one too!! Nancy, what a beautiful gift! Such a lovely journal now!!!! Great idea! It looks beautiful. Thanks for sharing. Great idea to personalize a notebook for a journal. Great job! I am sure she will love this! Great job on this journal! This is stunning... I love the softness and the "Nana". SO CUTE!! This adorable card really caught my attention because Nana is what my granddaughters call me. Beautiful job! Super cute journal and love the Nana on the front!! I miss my Nana and now my grandson calls me Nana! Very pretty, nice idea for a quick gift. Im sure anyone that receives this will love it. I'm sure she'll love it. Very pretty gift idea. Oh wow. So pretty!! I just know she'll love it!! Beautiful card! I love the soft color you used. I love your notebook. Thank you for sharing. What a beautiful card!! Thanks for the chance to win. I'm sure she will love this notebook! It is very pretty. I'm sure she'll love it! TFS! Another great idea for a fast and easy gift! this journal is great. love all the inspiration. Beautifully decorated. Love the lace. Cute, I like the personal touch. Soooo cute! I'm sure she'll love it. Love the bow. Lovely journal it turned beautiful! I am sure she will be thrilled to get it! Great Job! This is really pretty, and I have that paper too! I love journals. What a great gift. She's gonna love it!! Very nice journal, I am sure Nana will love it. That's really sweet! Nana will love it! What a super sweet gift! I love the look of the altered composition notebook. Great job! I think Nana will love it--very pretty.